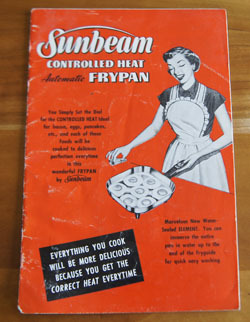 Cookbook #213: Sunbeam Controlled Heat Automatic Frypan, Sunbeam Corporation, Chicago, Illinois,1953. After 5 pages of instructions, there are about 12 pages of recipes. The first section is recipes for “Pan-broiling, Sauteing, Frying and Toasting Sandwiches”, including pan broiled steak, breaded steaks, meatballs, hash, lambburgers, salmon patties, omelet, fritters, corn fritters, potato patties, vegetables, and toasted (grilled) sandwiches. 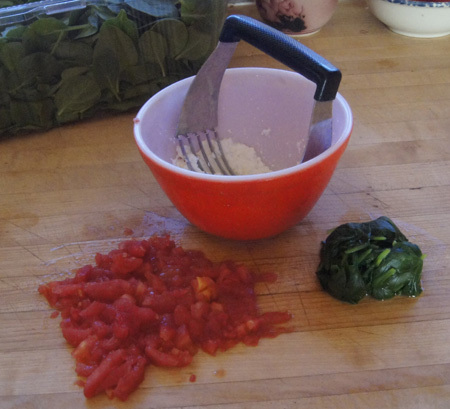 The second section is recipes for using the fry pan with a lid. “Adjust dial to keep liquid just bubbling when light is on, a setting of about 200-240˚.” It includes recipes for pot roast, Swiss steak, stews, braised meat chops, veal rolls, chop suey, sukiyaki, meat balls, barbecued hamburger, chicken fricassee, scalloped potatoes, fried potatoes, hamburger macaroni casserole, fried chicken, baked beans, and frankfurter casserole. 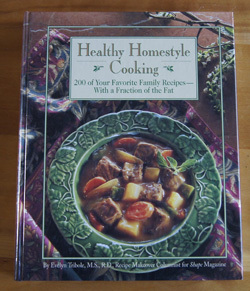 All of the above recipes reflect the cooking of the mid-twentieth century. 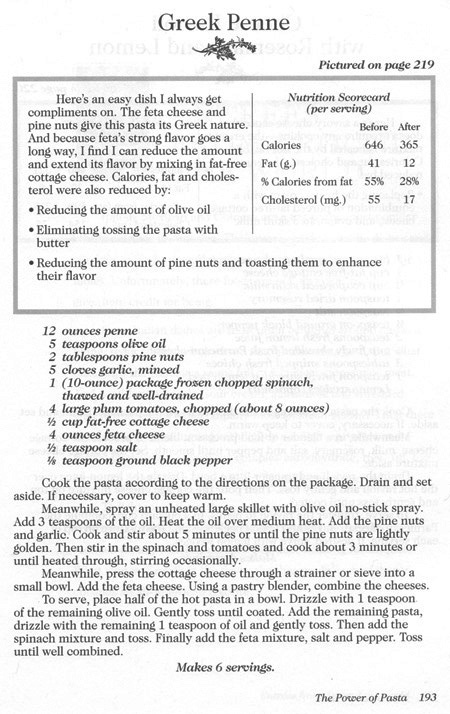 And in fact, many of these recipes are similar to what I cook today. But I fry in a good, heavy (shall I add expensive?) non-stick pan on the stove top, and I braise in good, heavy iron or enameled pots in the oven. The next section is for baking cakes in the fry pan. No no no, that’s not for me. Packaged cake mixes, brownies, coffee cakes in the fry pan – and I really don’t think it would be easy to invert the fry pan and get these baked items out cleanly. I’ll stick to baking in the oven. 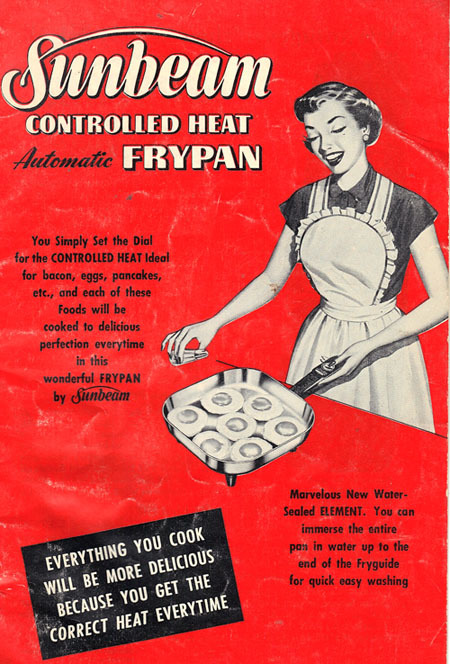 Other uses for the fry pan include popcorn, fudge, frying doughnuts, baked potatoes, cooking vegetables and cereal, heating baby foods, crisping crackers, defrosting, heating TV dinners (“frozen tray dinners”), baking frozen foods (including pizza), as a chafing dish, and for making white sauce. From this wide breadth of uses, it seems that a person could cook just about anything without a stove. This might work for staying in cabins, or for marginal housing arrangements. For us, we could use it in a power outage, since our backup generator gives us good but limited household power. 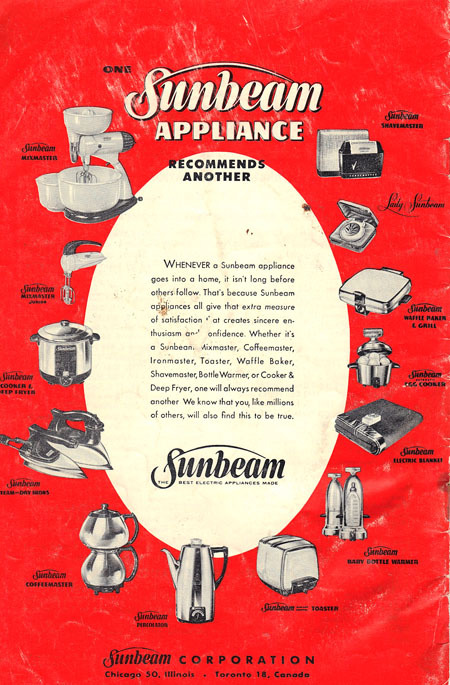 Look at all the Sunbeam appliances! Mixer (see my old Sunbeam mixer post), deep fryer (see my Sunbeam deep fat fryer post), irons, coffee pot, toaster, baby bottle warmer (interesting, since I just did a post on how to feed your baby), electric blanket, egg cooker, waffle maker, Lady Sunbeam razor, and shavemaster. I am going to keep this cookbook. Not for the recipes, but for the nostalgia. Brings back memories. 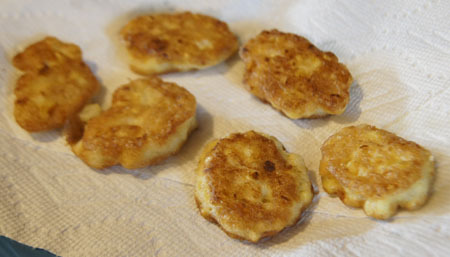 For this blog, I will make Corn Fritters. Hey, in the directions they spell egg yolks “yokes!” I almost didn’t catch that. I am making these for just two, so will one-third the recipe. I am not about to get out the big frypan just to make a small batch of fritters! I choose a medium non-stick frypan. I know how big the frypan is, and 1/2 cup oil would cover the bottom, but not fill it to the depth of deep frying, so I adjust my amount of oil by that guideline. Instead of serving them with syrup, I’ll have them as a side dish with one of my favorites, Southwestern Chicken. Beat the egg white until stiff. In a separate bowl, beat the egg yolk on high for about half a minute, then turn to low and add the flour and salt and pepper. Stir in the corn. Fold the egg white into the egg yolk mixture. Drop in the corn fritter batter by spoonfuls. Fry on both sides until golden brown. I liked these! But, my dining partner wasn’t impressed. The Southwestern Chicken was enough for him. I think these would have been good with syrup, as suggested in the recipe. I would like them fried in less oil than I used. 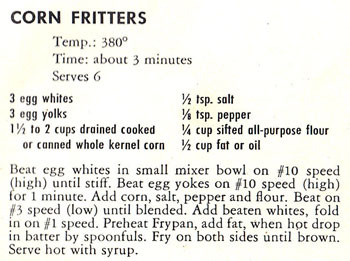 This is a good recipe for very easy corn fritters; I just need to figure out how to include them in a dinner – or breakfast – plan. 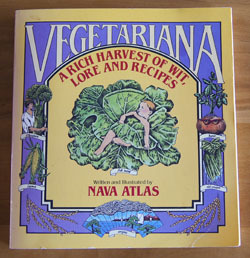 Cookbook #140: Vegetariana, Nava Atlas, The Dial Press, Doubleday & Company, Inc., Garden City, New York, 1984. As I turn the pages of Nava Atlas’s book, I get hung up on reading and pondering all these non-recipe “extras”. I can copy a few quotes and a bit of lore, but I can’t show you all the illustrations (copyright issues and/or laziness on my part). Happily, Amazon will let you view some of this book (click on ‘Look Inside’). Shame-faced, I haven’t tried many (or any?) of the recipes. I have always meant to take a day a week and cook no-meat meals. But it never really happens (and I can only blame some of this on my partner-in-eating). So us hippie baby boomers weren’t so groundbreaking. Funny how each generation thinks they are the first to discover the world. Happily, Nava Atlas is still writing, and enchanting us and sharing recipes. Do visit her website: VegKitchen with Nava Atlas. Recipes in this book? Lusty Curried Peas, Vegetable Lo Mein, Buckwheat Noodles with Snow Peas, Herbed Wheat Berries, Barley and Blackeye Peas, Mozzarella Mashed Potato Pie, Mushroom Barley Soup, Potato Corn Chowder, Chocolate Chip Peanut Cake. All the recipes look easy to follow, are nicely seasoned, use fairly common ingredients – and many are interesting, even to non-vegetarians. I choose to make “Swiss Cheese or Gruyère Pancakes”. 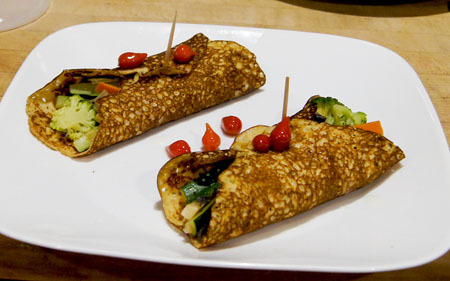 Cheese goes right into the batter of these crepe-like pancakes. Atlas suggests serving them with “Summer Harvest Squash Saute” (butternut and summer squash and zucchini sauted in butter with wine, soy sauce and herbs), filled with steamed vegetables, or sauced with Onion and Garlic Sauce. I plan to stuff them with steamed vegetables. I made a half recipe; since it is hard to “halve” an egg, I beat up two eggs, weighed the total, then used 3/4 of the amount (this translated to 75 grams of beaten egg.) The remaining egg went into scrambled eggs the next day. 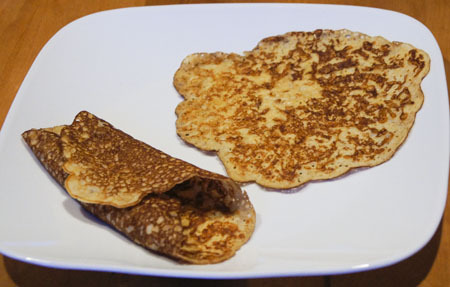 These cook up like crepes, so that is what I am calling them in my version of this recipe, below. 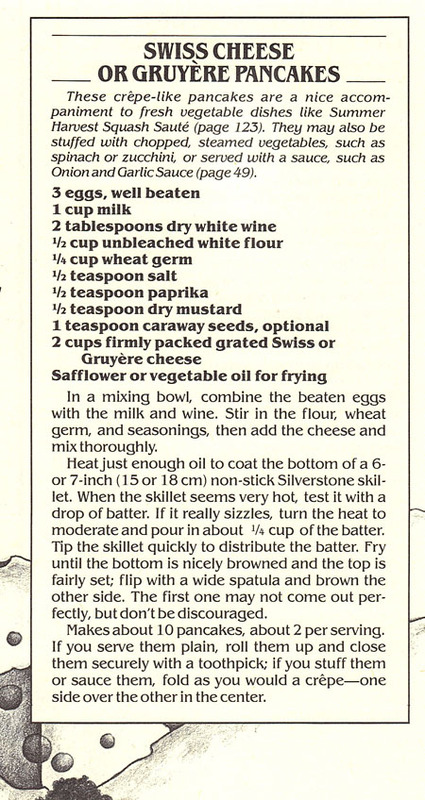 Combine the eggs, milk and wine. Stir together the wheat germ, salt, paprika, and mustard, then add to the egg mixture. Stir in the cheese. Heat a pan until a drop of batter or water sizzles when dropped on it. Turn the burner down to medium to medium-high because these crepes brown a bit easier than most due to the cheese in the batter. Add a little butter or non-stick spray, then pour about 1/4 cup of the batter into the pan and tilt the pan so the batter spreads. Cook until brown, then flip and briefly cook the other side. Continue until all the crepes have been cooked. I served them with a medley of steamed vegetables. I would also love these wrapped around cooked, creamed or plain spinach. I added cooked salmon to the meal to satisfy our non-vegetarian cravings. Later in the week I used one like a taco, filled with ham and tomatoes and lettuce. Delicious! Cookbook #128: Diet for a Small Planet, Frances Moore Lappé, Ballantine Books, NY, NY, 1971. 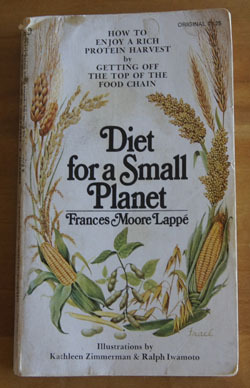 I bought Diet for a Small Planet in the 1970s when it was a popular book in the health food movement. In this book, Lappé encourages everyone to become vegetarians (or at least eat less meat), because raising meat requires a lot more resources than does growing crops meant for direct human consumption. One drawback to becoming a vegetarian can be a lack of protein in the diet. Lappé has a solution for that: the quality of protein found in meat could be had for vegetarians if they combined specific vegetable groups to obtain “complete proteins”. What is a “complete protein”? Here goes. Proteins are made up of chains of amino acids (trust me, this is true, I am a chemist!). According to Lappé, a complete protein contains the eight amino acids that our bodies cannot make: tryptophan, leucine, isoleucine, lysine, valine, threonine, the sulfur containing amino acids, and the aromatic amino acids. These are the essential amino acids, or EAAs. These EAAs must not only be present in our foods, they must be present in the right proportions. And you need to eat the complementary foods in the same meal. For instance. Nuts like sunflower seeds are high in the amino acid tryptophan and low in lysine, while legumes like black beans are high in the amino acid lysine and low in tryptophan. Toss some sunflower seeds on top of black beans and you consume a complete protein. Examples of other combinations are grains and milk products, seeds and legumes, and grains and legumes. (Note the milk products: this is not a vegan diet.) 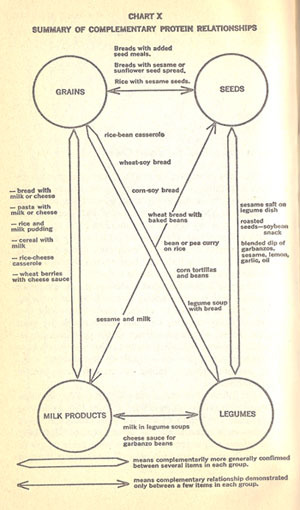 Often the traditional dishes of cultures exemplify Lappé’s theory: Cajun red beans and rice, India’s dal and flat wheat bread, Mexican beans and corn. The first part of Diet for a Small Planet contains a ton of charts and tables to support Lappé’s hypothesis: Amino Acid Content of Foods and Biological Data on Proteins, Food Values of Portions Commonly Used, Composition of Foods, Amino Acid Content of Foods, Protein Requirements, Calorie Cost per Gram of Usable Protein, and more. The data in these tables is supported by bibliographical references. 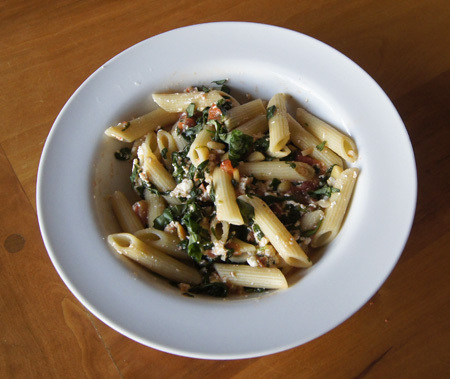 The second half gives recipes for twenty different vegetable combinations. I swallowed the “complete protein” theory totally, and although I never became a vegetarian, I believed the theory after reading this book. I do remember hearing that you no longer had to eat the combinations in the same meal, only the same day or so. Imagine my surprise when I went online today and found that the complete protein method is no longer held as true! In this 2013 article, Jeff Novick writes that Lappé’s hypothesis is based on a 1952 article by William Rose that reported minimum daily requirements of the eight EAAs. Rose then doubled the minimum and claimed it as the recommended daily requirement. Novick states: “Modern researchers know that it is virtually impossible to design a calorie-sufficient diet based on unprocessed whole natural plant foods that is deficient in any of the amino acids.” Setting the Record Straight, by Michael Bluejay (2013), is another good article that refutes the complementary protein theory. Interestingly, Wikipedia’s article on Complete Protein does not address the controversy. Tabouli, or Tabbouleh, is an Arabian dish. It usually doesn’t contain garbanzos (chick peas), although these beans are quite common in Middle Eastern cooking. Lappé’s version of tabouli calls for dried garbanzos and I wanted to use canned ones, so I just sort of guessed at the amount of beans to use. 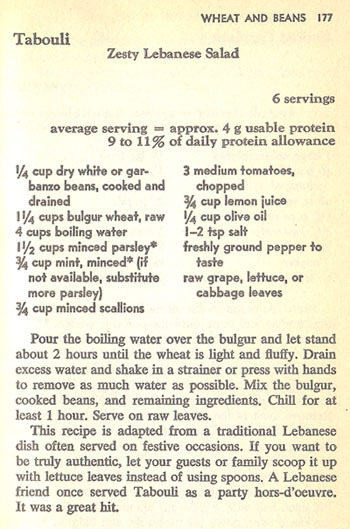 Also, I often make myself a bulghur salad, and usually just toss it together sans recipe, so I again strayed from the book’s version of tabouli. 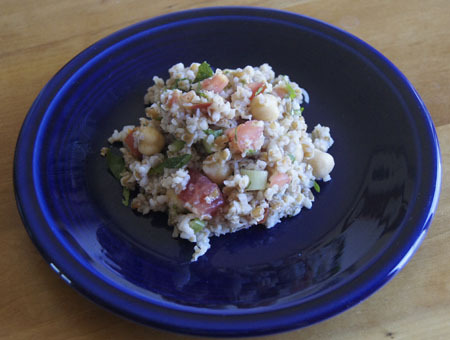 Boil the water in a pan, then add the bulgur. Leave it on the burner for a minute or two, then remove from the heat and let stand at least 10 minutes. Put in a strainer to drain off all the water, then put it in a bowl. Add all of the remaining ingredients and mix. Refrigerate until cold. Taste the salad and adjust the seasonings if you want to. 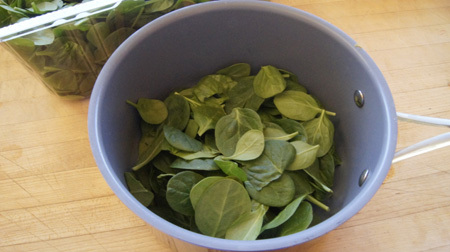 Serve as a side dish or over greens. I really liked this salad, especially with some feta cheese mixed in. And the cookbook, Diet for a Small Planet? I will keep it, for nostalgia rather than the recipes.